That's all you really need for a basic magnetic mount. Use the big square metal plate and put it inside the case. See this post for more info. I didn't think the CAW CAR was needed. It worked just fine with just the TechMatte. So the nice thing about the wireless car charger mount is it comes with a metal ring that you can mount inside your case around the wireless charging receiver module. It also comes with an optional sticky base mount. So what I did was take the round metal plate from the TechMatte, peal off the back end to expose the adhesive, do the same on the bottom of the Renbon base, and stick the round metal plate to the base. What I've done now is created a nice metal base plate for the Renbon base. Now I just stick the Renbon base to the TechMatte magnetically. NOTHING PERMANENT! Nothing sticking to the car. Easy to remove. Doesn't directly block my vents and covers less of the screen and is nicely in view at a good angle. So it's techmatte wedged behind the infotainment screen, then the Renbon base has a metal plate stuck to the bottom and is magnetically attached to the techmatte, the renbon charger is then clipped to the base. It works pretty well but there are some things I don't like about it. The whole thing seems to be pretty sturdy and the phone or the mounts won't come flying off even with spirited driving and you can wireless charge while it is mounted BUT the whole thing shakes a bit more than I like. The ball and socket on the Renbon doesn't have enough friction. The Rebon clip sometimes starts to work its way out of the base. Sometimes (but not often) you have to unplug and replug the renbon to get it charging again. It's not easy to gain back access to the lightening port so that means no easy car play. I use an anker wireless charging pad and stand in the house and those work fine with the wireless charging receiver module. All in all I'm not sure it's worth converting an older iPhone like mine to have wireless charging. It will be much better when I get a new phone later this fall with built in wireless charging. So for now I think just having the techmatte mount is definitely worth getting. I just picked up a 2018 Civic Si Sedan (modern steel). I'm loving it so far. My first car out of college was a black 1993 Acura Integra GS manual. It was probably my favorite car. Sadly, I sold it to a co-worker who's daughter then promptly totaled it. From there I moved on to an accord coupe and then a 2007 TL Type-S. I've been driving that for 11 years, and it still runs great. My oldest son just got his driving license so I passed down the TL to him (I know, it's a crazy amount of car for a teenager) so I could find something new to drive. I wanted that feeling I had back with my Integra: a smaller, lighter, more nimble driving experience, and manual. Well, I think I've found it in the Si and is even more fun and exciting than that Integra (though I really think that year of Integra was a great looking car). I did look at the CTR but my wife side "R" stood for Ridiculous which is what she said I looked like in it. 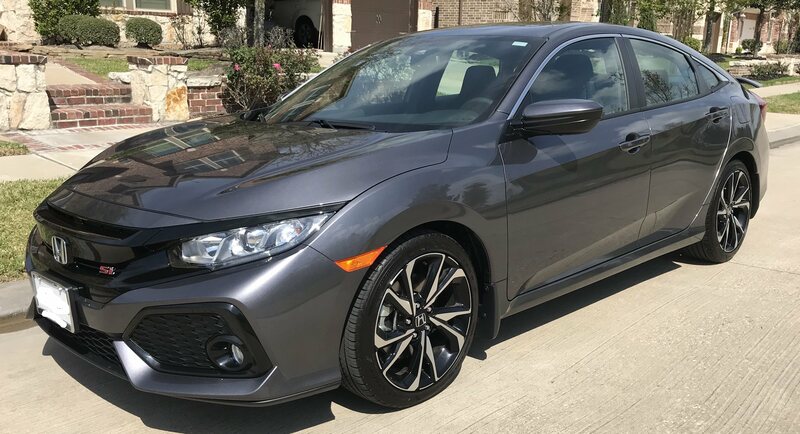 I'm fine with the CTR looks but it really is hard to beat the Si value. So much car and economy for a very reasonable price. I haven't driven a stick in over 20 years. It really is like riding a bike. I'm still working on that rev hang and trying to wait a bit longer on letting up the clutch especially from 1-2 and 2-3 and remembering to blip going down. Manual really is so much more of an engaging driving experience, and I look forward to actually practicing and getting better. I almost went the other direction in getting something really techy with all the assist dodads or electric but I'm super happy with my decision to go with the Si. I love how practical this sporty compact sedan is. It's got great gas milage, very livable back seats, seats 5, and a nice sized trunk with 40/60 fold down seats. It also has a bunch of standard features like heated seats, moon roof, dual zone auto climate control, apple carplay and android auto, and lanewatch camera. I also added the auto dimming rear view mirror and wireless phone charger. Carplay works really well and with most of the apps I use like downcast, audible, and spotify. I wish apple would let third party map apps work but alas you are stuck with apple maps which isn't horrible anymore. At least it works really well with carplay. And of course Siri but Siri and I don't get along so well. One thing I didn't realize is for carplay to work you must plug in a lightning cable. Newer versions of iOS does support wireless carplay but apparently few cars do. The only other feature I really miss is homelink. Phone mounting becomes a bit of an issue since there is no cd player at all and therefore no slot to mount to. The solution I'm thinking about doing is found here. UPDATE: The techmatte alone works really well. I don't think you really need the car.claw since the techmatte has enough angle. Easily my favorite game of year!